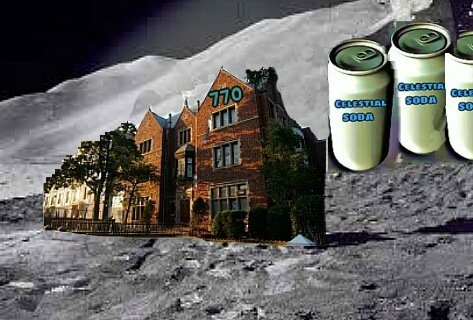 A Chabad House on the Moon? I was skeptical at first, but as headline after headline poured in, I realized that the thought was not so out-of-this-world as it first seemed. Well, I mean it was out-of-this-world, but I started to reconcile myself with this fact. There is a popular saying that wherever in the world there is Coca-Cola, there is Chabad. So when I saw the headlines about a Japanese sports drink company working to put a giant soda can on the moon, I began to think that maybe a Chabad House should go there as well. First it should be mentioned that while the original saying mentions Coca-Cola, when and if Coke decides to put a giant soda can on the moon, we would be happy to supply an additional Chabad House to position next to it. But since the Japanese makers of Pocari Sweat are already hard at work, then presumably they would be the first to contact with our proposal. Do you want to launch a Chabad rabbi and his family to the moon? Nope. The intent is to promote the ubiquitous nature of Chabad (in both place and teaching). That wherever you are in the world (or outside the world), you can find Chabad. If Elon Musk’s “space taxi” takes off—which presumably would enable space tourism to become more available and affordable–then the giant soda can and Chabad House would also become a tourist attraction. A photo opportunity for tourists visiting the moon’s surface. If The Moonhouse planners are agreeable, they would be commissioned to design a moonhouse replica of 770 Eastern Parkway, headquarters of Chabad, a building that already has ten or so replicas around the world. Interestingly, the red color of The Moonhouse is remarkably similar to 770. What’s so exciting about the Moon? In Hebrew the word “month” (חוֹדֶשׁ) is from the same root as “new” (חָדָשׁ), because the new moon, which marks the beginning of the month, is a symbol of renewal. The mitzvah to “sanctify the month” (קִידוּשׁ הַחוֹדֶשׁ) is the very first commandment given to the Jewish People as a nation, as the Exodus from Egypt approached. In fact, the sages ask why the Torah doesn’t begin with the verse, “This month is for you”―since it is the first commandment that the Jewish People were commanded to keep. “Everything follows the beginning” and if this is the first commandment then it is obvious that this is not an individual commandment―just one of the 613 commandments―but a general commandment, the key that opens up the entire world of Torah and mitzvot. Relating back to our present topic, the newness that the moon-inspired public is searching for is the renewal and redemption of the Jewish people (and from there, the entire world). God approaches the Jewish people as the One who brought them out of Egypt (מִצְרָיִם), because it is He who brings out of all constraints (מְצָרִים)―even the physical constraints of the body―and renews souls.